I’ve heard it said that out of necessity comes some of the greatest creations. I think that could be said about our team of Chino Hills tutors at the Brain Zone. 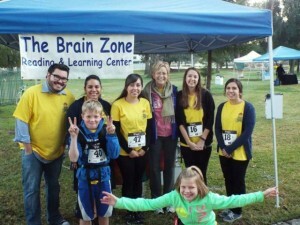 Hi, I’m Donna Rutherford, founder of the Brain Zone Reading & Tutoring Center. I was a consultant in the software support industry for 22-years. Then something happened that changed my life. My daughter was diagnosed with attention deficit hyperactivity disorder. I looked in every direction for a solution. I quickly learned a few important facts. First, I learned very little is known about learning disabilities. The scientific community and the educational community don’t seem to work together very well . . . if at all. Next, I learned that many people are lurking out there that are quite willing to take your hard earned money and not return your phone calls when their solution doesn’t work. Finally, I learned there is no one ‘fix’ for this neurological disorder or any of the other learning disabilities for that matter. What works for one child does not necessarily work for another. And still my child needed help. She needed to learn to read, to develop her reading comprehension skills, to write a paragraph, to develop her fine motor skills so her printing was legible. She needed help and there wasn’t any. I’m just mom. A mom that could not stand by the side lines watching her child being called ‘lazy,’ ‘unmotivated’ and a host of other hurtful labels. I burned the candle at both ends staying up nights until the sun brought in a new day. I read text books, manuals, research reports, and took classes all over the United States. I tried every program and technique I learned on my daughter. Some worked and some did not but we made progress. Baby step by baby step, she progressed. Over the course of a year, her reading comprehension skills went from a second grade level to a sixth grade level. In one year we made more progress on our own than four years in private and public schools. She also began learning techniques that helped her to focus. She began to be able to sit at the table without turning over the chair or falling off of it from wiggling so much. In our small town of Chino Hills word travels fast. A woman called me one day and asked if I would teach her second grader to read like I taught mine. I laughed, thinking this had to be a joke, but she did not seem to think it was funny. She began to tell me her story, which sounded amazingly similar to my own. I agreed to do what I could . . . until my next consulting assignment came up. I did not know then that my life had just taken a new direction. Before I realized it, I was busy all day, every day, teaching reading. The Brain Zone was born. If you are looking for fancy degrees or lots of initials after our names — well, you may not find that here. If you are looking for a chain of learning centers located all over the country, you will not find that either. What you will find is a small learning center, located in the heart of Chino Hills, with instructors that truly care about your child. You will find a team of specialists that keep on top of new research and apply it immediately to our kids . . . and your kids. You have my personal commitment to your child. I will work as hard to find a solution to your child’s learning struggles as I did for own daughter. Our Mission is to provide children of all ability levels a place to grow and learn. Our priority is to teach children to turn on both sides of their brain and return learning to the fun and enjoyable experience it was intended to be. To this solid foundation we will add caring, kindness and a rich academic program. We believe this combination is a working model for lifelong learning success. If this sounds right for you and your child, give us call. We’re here to offer our knowledge, our personal experience, and our support to overcome all types of learning challenges.